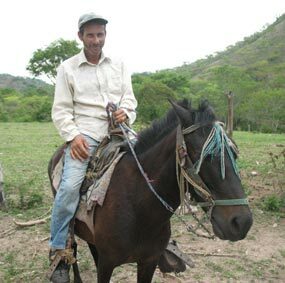 The Rio Olancho coffee growers who participate in this project come from various communities in rural Olancho, but they all have several things in common. Each of the participating communities is served through Diaconia Nacional de Honduras – the agency of the Christian Reformed Church in Honduras that focuses on practical ways to alleviate poverty and improve the quality of life for Hondurans. Arturo Colindres (photo above, red shirt), the coordinator of Diaconia Nacional's community transformation programs, personally works alongside the Rio Olancho coffee growers, helping them to share best practices. And Arturo arranges for training workshops where coffee growers can learn from the experts with the Honduran Coffee Institute (IHCAFE). At these training workshops, coffee producers learn how to preserve the mountain environment where their coffee is grown, ensuring that water, trees and plants, birds and wildlife are protected. 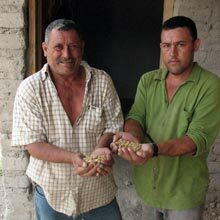 They are taught how to create natural compost from the husks of the harvested coffee beans, and how to use natural methods for insect control. Additionally, they and their pickers receive instruction in how to select only the best coffee cherries at the optimum point of ripeness, and how to properly dry their coffee harvest and protect it harvest from rain. Each of the Rio Olancho coffee growers is committed to producing the highest quality coffee possible. And, with the training provided through Diaconia Nacional and IHCAFE, they can take the necessary steps at all stages of the growing cycle to ensure that only the very best coffee is sent for export. Coffee growers take part in a training session organized through Diaconia Nacional and the Honduran Coffee Institute.